Robotic insects might replace robotic humans soon. For all their intelligence and their evolution, humans are too complex to replicate in machines. Each movement in a human is controlled by a bunch of circuits called central pattern generators (cpg) within the main neural network. Designing these is a waste of time when there are insects walking around with the same handful of circuits that control all their gait. The newly designed robot has only one cpg. Sensory inputs like crawling uphill control the cpg which, in turn, instructs the robot on the gait to assume. Butterflies are fast losing out to warming. They keep shifting to new habitats that allow some respite from heat: populations near sea levels are vacating fast, in the mountains the reduction is slower and at the tree lines they are increasing. As temperatures rise, the tree lines expand. Butterflies also do the same—the ones living at lower altitudes are moving upwards with the result that butterflies living at higher altitudes ‘have no place to go except heaven’. The butterflies that live in fragmented habitats like hedges, bushes are the hardest hit. Along with warming, demand for land has done away with their homes. As the butterflies flit between farmlands, a reduction in their numbers implies reduced crop yield. Testosterone delays wound healing by prolonging inflammation. When scientists blocked the male hormone’s effects in mice, injuries healed quickly. The finding could help in reversing delayed healing in older people. When the body is injured, the affected area is a site of constant activity. White blood cells clean the wound, fight invaders and set in the process of healing which also includes inflammation of the injured site. But an inflammation that stays for a long time is not good either. Researchers have developed a cheap test to catch the bloodsucking barber pole worms that reside in the stomach of cattle, lay eggs by the 10,000s every day and cause losses worth millions of dollars to the wool industry each year. The test requires a bit of the animal’s faeces wherein a protein binds to the escaping eggs making them visible. Detecting the worms was tricky so far as it involved gazing at the lower eyelids of the animals to see if they looked anaemic which is one of the symptoms. * Risk of cancers rose 9 per cent. * Risk of death from all causes was higher by 11 per cent. * Risk of cardiovascular diseases increased 18 per cent. * The cardiovascular disease risk was 80 per cent higher for those who watched television for more than four hours daily irrespective of whether they smoked or had an unhealthy diet. People either sit in front of the television or the office computer for hours at a stretch. Lack of exercises cannot keep the body fit, thus making it vulnerable to diseases. Why do galaxies come in different shapes? In the 1930s, the astrophysicist Edwin Hubble classified them on their shapes: spiral with two arms and a central disc, barred spiral with arms and a central bar (Milky Way) and elliptical. But the Hubble sequence could not explain the origin of the shapes. For the first time two astronomers used a computer model to trace 13 billion years of cosmic evolution and found the answer in the enigmatic dark matter and dark energy. These invisible forces shape the galaxies. Embedded within large rings of this matter, the galaxy is shaped by the way it behaves. The Bering strait caused climate change 100,000 years ago. Owing to its strategic location between the Arctic and the Pacific oceans, it impacted the climate from tropics to poles. When sea levels dropped the strait closed. Fresh waters from the Pacific ocean could not be transported to the North Atlantic ocean, making it warmer, saltier. This caused the Northern ice sheets to melt. Repeated opening and closing of the strait led ice sheets to fluctuate between expanding and melting. Sea levels worldwide dropped or rose by as much as 30m. 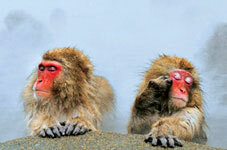 Asian monkeys are the new guinea pigs for experiments to gauge lead pollution. Macaques are the closest living primates to humans. They eat the same food as humans, drink the same fluids and even live side by side in parts of South and Southeast Asia, like Nepal. Toxicologists took hair samples from three groups of free-living macaques in and around a temple in Kathmandu in Nepal. The hair samples tested positive for lead; the toxicant was found in higher levels in younger macaques’ hair samples. These results indicate the level of lead contamination, from electronic and industrial waste, faced by humans in those areas. Lead in blood damages the brain, affects blood circulation and the reproductive system and leads to decreased intelligence in children. Crops have a friend in the highly venomous Israeli yellow scorpion. Nurtured by years of evolution, the venom is lethal to leaf-eating moths, locusts and beetles but harmless to honeybees. Scientists discovered this gold mine after spending years researching on scorpion venom. They developed genetic methods to develop and manipulate the toxin to study how best it can attack the insects’ nervous sytem. This paves the way for a new class of insecticides to do away with the pyrethroids that have lost their edge against rapidly evolving pests. 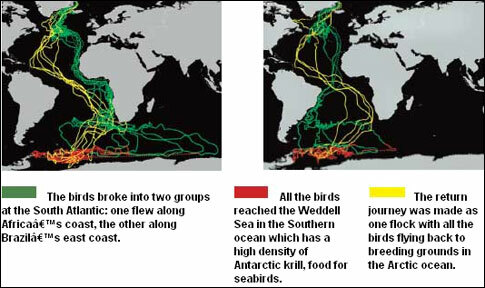 Scientists tracked the migration of two populations (Greenland and Iceland) of the Arctic tern. With an average length of 35 cm and wingspan of 80 cm, the small birds travel from the Arctic where they breed to the Antarctic, their winter stopover. The one-way distance of 24,270 km is covered in 40 days. The entire journey from departure in August to return in late May was the longest recorded route travelled by any animal.